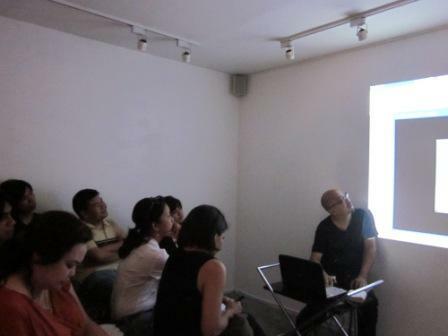 The warmest of thanks to those who came to the artist talk and "closing" of Tad Ermitano's first solo exhibition, Passage, last Saturday at Pablo Gallery Fort Bonifacio. We're happy to announce for those who haven't seen the show that Passage will be having an extended run until this Saturday, 5 February 2011. Those who are interested in obtaining pictures of the exhibition for documentation and press coverage may click here to download hi-resolution pictures (link expires 5 February, 2 am Manila time). Video documentation will be uploaded in youtube after the exhibition run. Pablo Gallery is located at C-11 South of Market Condominium, 11th Avenue corner 26th Avenue, Fort Bonifacio Taguig and is open Tuesday to Saturday, 12 - 7 PM. The next activity of End Frame Video Art Project 3: Present will be in late March at the Ateneo Art Gallery wherein End Frame 3 curator Clarissa Chikiamco will discuss the video art collection of the Fukuoka Asian Art Museum after her research residency there this February to March. There will also be more talks presented in the months running up till the next End Frame 3 solo exhibition, which will be of Manny Montelibano, opening in August at Gallery Nova. More details on these events will be released closer to the dates.